"Paulo," he said, "It looks like I've lost a cylinder. There's oil leaking on to the windscreen. I'm going to land at Independência." Paulo, also in the sky over the Amazonian rainforest, 22 minutes' flying time away, tried urgently to dissuade him: "No, you can't," he said. "There's no longer any landing strip there; it was abandoned 15 years ago. 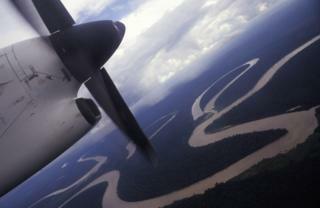 Aim for the river, the Parú, instead - try to land on water." But it was no use. "No, no, I've decided to land at Independência," Jeziel replied. "I can't make anything out any more." Then the signal cut out. Those were the last words Paulo heard from his friend of 37 years. He turned round in mid-air to try to find Jeziel. But it was hopeless. Paulo ran straight into one of the Amazon's sudden, terrifying rain-storms, when light aircraft have to fly low, underneath the towering black clouds, to have any visibility at all. Jeziel had been flying his single-engine Embraer air-taxi, registration PT-RDZ, from the isolated Amazonian Indian village of Matawaré, in the Tumucumaque Mountains National Park, near Brazil's northern border with French Guiana, to the mining town of Laranjal do Jarí, a journey of about 1 hour and 45 minutes that he'd made many times before. On board were two groups of Amazonian Indians from the village, a teacher called Pantia Tiriyó with his wife Pansina and their three children, the youngest just three years old - and an older woman, Sepi Akuriyó, with her son-in-law Jesaraya Tiriyó. Image caption Flavia Moura: "We feel abandoned"
Since then, indigenous people's organisations have repeatedly appealed to the Defence Ministry to organise a ground search, as has happened after some previous disappearances - but in vain. That's despite new information emerging from an eyewitness who said he saw a plane flying low, as if about to land, on the day PT-RDZ came down. Flavia Moura, the pilot's daughter, is in despair. "We feel abandoned. Totally," she says. "We're yelling every day, my brothers and me, begging for any help to continue the search, but no-one's come, no-one's helped. Is it because they are Indians, because they're ordinary people, that no-one has offered to help?" Those appeals have received strong support from Brazil's Public Prosecutor's office, which is threatening to take the Defence Ministry to court if it doesn't resume the search. But Alexandre Guimarães, the Federal Prosecutor-General in the state of Amapá says the difficulty in finding PT-RDZ exposes a much more serious, long-standing government failure - the lack of air traffic control in the Amazon and other remote parts of Brazil, which disproportionately affects its indigenous population. Most landing strips serving indigenous communities in the Amazon aren't registered, because they don't meet safety standards. And that means pilots can't officially take off or land from them. So, in order to provide transport for isolated communities, pilots are obliged to file fake plans, giving an incorrect point of departure or destination. Adrian Young of the Netherlands-based aviation consultancy, to70, which advises airports, airlines, and governments around the world, said: "A regulatory system that requires pilots to falsify flight plans, to lie about basic information is scandalous. It's unsafe - and in such an isolated region, you can't just deny people access to travel." But one, Paulo Nortes, said: "You have to fly quietly, with the transponder sometimes turned off, and the flight controllers and the government don't really know about those flights. They're not being monitored by any controller." And yet, as he says, flying in the Amazon can be very dangerous. "There are a few airstrips that are like rollercoasters… and you must be aware all the time of the weather, not to get inside a heavy storm, because it plays with your plane as if it was a paper plane, like a toy." "We are very worried, because we are the users of this transport system," she says. "The landing strips need to be safer not just for indigenous people themselves, but also for government employees who provide health and education services, who use the airstrips all the time." But so far there's been no result - despite a court ruling won six years ago by Alexandre Guimarães, obliging the Civil Aviation Authority (ANAC) and other responsible bodies to upgrade airfields. "There are 249 landing strips that aren't regulated by the Civil Aviation Authority and these strips are in indigenous land," he says. "All this is the fault of those state bodies that have not carried out their legal duty to regularise these landing strips." This would cost a lot of money, but Cecília Apalai says it's essential because indigenous people are obliged to travel to cities to take advantage of their rights as Brazilian citizens. Eventually, at the end of January, they had to give up. Food supplies - all carried on their backs - had almost run out, and one of the searchers, the father of Pansina Tiriyó, had contracted malaria. Pansina's brother, Aksuni, followed the progress of the mission as the searchers radioed in each day to the hostel where he is staying in Macapá. "We grew up together, we're about the same age, and she lived in the next house to mine," he says. "So we were always talking, we were really close. I used to talk to her, play with her… and now maybe I won't have my sister, I won't have that close person to be with me." Flavia Moura, daughter of the pilot, Jeziel, says she can't begin the grieving process until his plane is found. "I know this is a pain that will never heal," she says. "I can't see him, I can't bury him, I can't say goodbye. And I don't know whether I will see him again one day, or whether I'll never know what happened." None of the authorities involved agreed to an interview. But the Brazilian Air Force said in a statement that they had "carried out a search across a total area of 12,550 sq km... In total, the aircraft involved flew a distance of more than 20,000km, equal roughly to a journey from São Paulo to Tokyo, without finding any sign of the plane." The Ministry of Defence said that the search "can be reinitiated should any new information emerge." The Civil Aviation Authority said it was helping to map areas in regions that need landing strips. "The work aims to facilitate access to services, especially health, for the indigenous population. Discussions are now in a final phase and plans will be revealed fully as soon as they are approved." But indigenous organisations aren't satisfied. Kutanan Waiana, an activist who helped co-ordinate the volunteer search, is one of many who believe the official response to the plane's disappearance reflects historic racist attitudes to the country's native ethnic groups. "When indigenous people disappear, when they go down in a plane, the government only searches for 14 days, because it's an Indian who's vanished… who knows where he or she's gone?" he says. "For us, this says that in effect this government doesn't want to know about indigenous people, doesn't want to know about human lives, human beings." Officials seem to think it's more important to find minerals for the mining industry than missing indigenous people, he says. "I think this is the Brazilian government's lack of respect."